A sail is a large piece of cloth on the top of some boats. The wind goes around the sail and makes the boat move through the water. The piece that the sail is attached to is called a mast. Some boats have many sails, and some have only one. Usually, small boats have only one sail, and bigger boats have more. Boats with sails are called sailing boats. There are many different names for different kinds of sailing boats with different kinds of sails. Before people made boats with engines that used coal or oil, sailing boats were an important way to travel across oceans. Now they are not so important for transport, but they are still used for recreation and competition. A mainsail is a sail located behind the main mast of a sailing vessel. A headsail also known as the jib sail, is any sail set forward of the main mast. A spinnaker or downwind sail (also termed Kite). Special-purpose sails are often a variation of the three main categories. 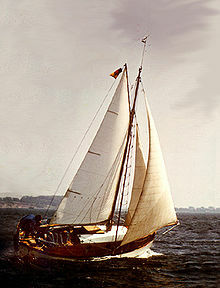 A staysail is a fore-and-aft rigged sail whose luff can be attached to a forestay running from a mast to the bowsprit. High-performance yachts, in particular some catamarans such as the International C-Class Catamaran, have used or use rigid wing sails, which are said to perform better than traditional soft sails. In particular, a rigid wing sail was used by Stars and Stripes, the defender which won the 1988 America's Cup, and by USA-17, the challenger which won the 2010 America's Cup. ↑ Torrey, Owen C., Jr. (1965). Sails (Seamen's Bank for Savings ed.). New York: Palmer & Oliver. pp. 7–9. ↑ Don Street (March 14, 2013). "Rig for a Staysail". Cruising World. Retrieved December 29, 2016. ↑ "Tom Speer - Home -". This page was last changed on 29 December 2016, at 20:23.